Well, Day 21 and Day 22 of the Fiber ‘Tudes Daily Dose of Fiber challenge have been quite fulfilling. 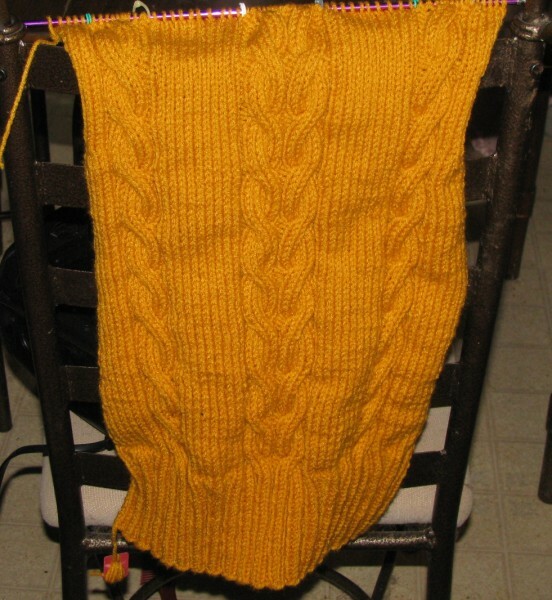 And I’ve been working on the armholes (that’s why it appears that there are only 5 stitches stockinette on the outside of those outer cables. 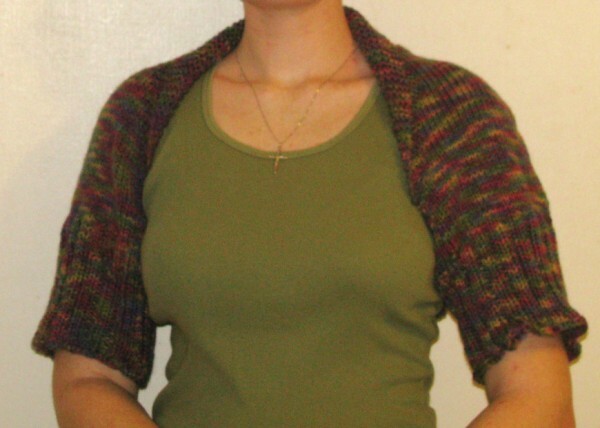 I am hoping to be done with the back this weekend and on to the next portion of the pattern. 🙂 I can’t wait to have a finished hoodie. This morning was chilly for Mississippi. It was 60* and I woke up huddled under both the sheets and a fleece blanket. I haven’t been feeling well either and when I don’t feel well I want to be wrapped in knitted or crocheted goodness. I’m positive that if I had finished this hoodie before feeling ill, I’d be feeling just peachy right now. In other news, the Kiss Loom Birthday party is tonight. In a little more than an hour, in fact. It should be fun….hope to see ya’ll there! Well, a week has passed since my last post on progress for the Daily Dose of Fiber. Believe me….I’ve been progressing. In fact, I have made a lot of progress in the past few days alone. I think 3 or more hours a day just in the past 2 days would fill all the time that I haven’t posted about, but I have been working on different projects. The socks are still a WIP….maybe some time this century I’ll pick them up and focus better on finishing them. Besides that hoodie, I also had to work up a pattern of mine again on the Kiss Loom so that I could make sure that my written directions were correct before I typed it up for the Kiss Loom’s 2nd Birthday Party this Saturday. 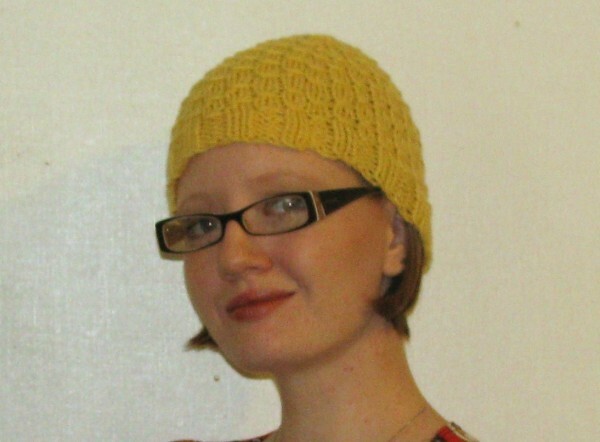 This hat has a ‘snakeskin’ stitch pattern to it and I have lovingly dedicated the name of the pattern to my dear friend, Vivian McKnight, who is just starting her battle with cancer. I think the hat would make a great chemo cap. And therefore, I strongly encourage those of you who do charity work to use it as often as you need to! I’m still chugging along (whether I actually accomplish anything or not) on the Fiber ‘Tudes Daily Dose of Fiber Challenge. Day 11 I worked about 2.5 hours on an ‘idea’ that I had. 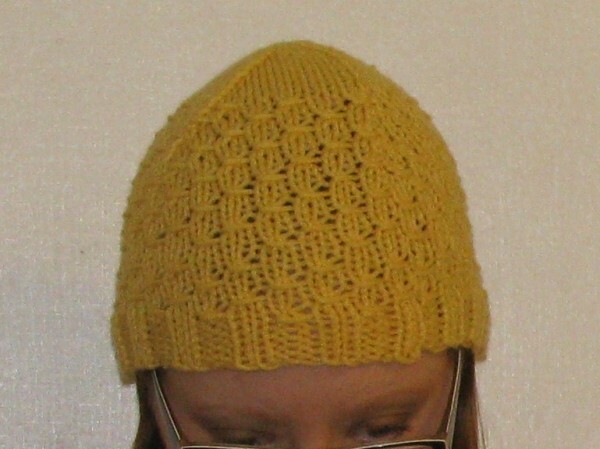 And since I used a cheap yarn to dabble with and my vision wasn’t totally visualized I tried it out with better yarn on Day 12…….but that was a big bust. A waste of three hours and really good yarn. Oh, well. Back to the drawing board. 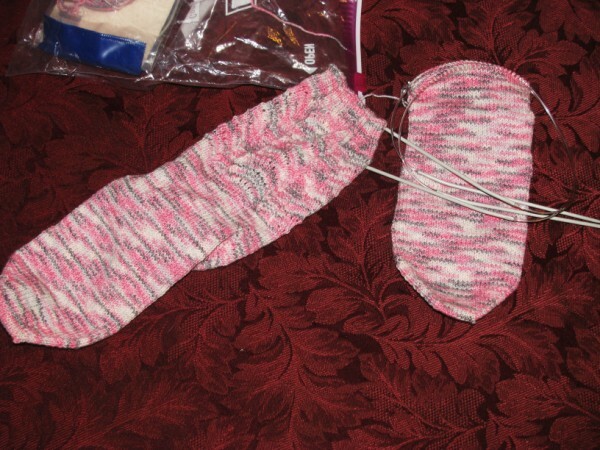 Ok, so on day 7 and 8 of the Fiber ‘Tudes Daily Dose of Fiber Challenge, I worked a little bit on my sock. LOL! Didn’t get far, though. Yesterday, Day 9, I should have worked on it again, but I was trying out stitch patterns and trying to calculate sizes from swatches, though nothing worked out right. So, I hope that counts as working with my fiber. Today, I’ll either be back to the drawing board with stitch patterns and calculations OR I’ll be working on the sock. Maybe I’ll get that sock done by the end of this week…..once I get the chores tamed down. LOL! I’m still doing Fiber ‘Tudes Daily Dose of Fiber Challenge! How about you? I also found out yesterday from my FIL that I’ll be singing at the Baldwyn Community Center at 2pm on Saturday…all….by….my…self. Prospect Worship Center is having a thingy up there at that community center and called to ask him if our ‘group’ could perform in that spot. Problem is: he has to work on Saturday, SIL (who is also in the group) will hopefully be moving into her new home that day, and my cousin-in-law….well we haven’t heard out of him in a while so the assumption is that he is really busy. He wouldn’t be able to practice before the gig because of his work schedule anyway. 😛 So, that left me. I’m probably the only one of us brave enough to stand in front of a crowd all alone and sing anyway. To tell you the truth, after every performance, it is all a blur. I can’t recall anything….not even if I sang the right lyrics. LOL! I’m not scared (just a little nervous right before stepping on stage, the normal: what if I forget the lyrics type of thing) but I just sorta don’t remember anything. Hahaha! Wish me luck, and if you can be there that’d be great! You know you love me! MWAH! My friend, Karen Gielen, has a BlogTalkRadio show with a few of her friends. The show is called Fiber ‘Tudes and I’ve decided that it would be perfect to listen to on my iPod Touch. 😀 They’ve recently sent up the challenge to create every day in August for at least 20 minutes a day. That shouldn’t be too hard for me, since I usually have yarn in my hands a lot of the time. And I figure since I am in a designing rut (meaning I’ve really only created a few new designs throughout this year so far and I don’t have the urge to design anything new at the moment….and let’s not have me confess the embarassing admission of how many times I’ve picked up a loom to make things with as of lately) I could maybe use this challenge to help me get my creativity back. Anyway, back to my point! I ACCEPT THE CHALLENGE AND WILL NOW CRAFT FOR AT LEAST 20 MINUTES A DAY WITH YARN FOR THE ENTIRE MONTH OF AUGUST! Even when my dad comes home to fix a few things that desperately need attention, I’ll sit down in the evening and knit or crochet. And I think the actual hard part will be remembering to blog about it. LOL! I encourage all you others out there that read my neglected blog to accept their challenge too. Just go to Fiber ‘Tudes and follow the rules in this post.